This craft is three of my favor things - glittery, quick and easy. Step One: Put your rubber band around your mason jar, where you want the glitter to start. Step Two: paint a light, even coat of your mod podge below the rubber band. Step Five: Remove the rubber band, then put some pretty flowers in your vase and enjoy. Simple and pretty, right? These glittered vases would make a great teacher's gift, look beautiful at a birthday party or shower - the possibilities are endless! You are the cutest. This is the cutest. Your pinterest cheat she is BRILLIANT!!! LOVE THIS!! I've been in need of a cute vase idea for my wedding. We are using old Starbucks Frap bottles. I think this will be the perfect idea! so, so cute! i think i need to make this. or a few! What a fun vase! I have so many mason jars that could use some sprucing up, thanks for the tutorial! What a great idea! 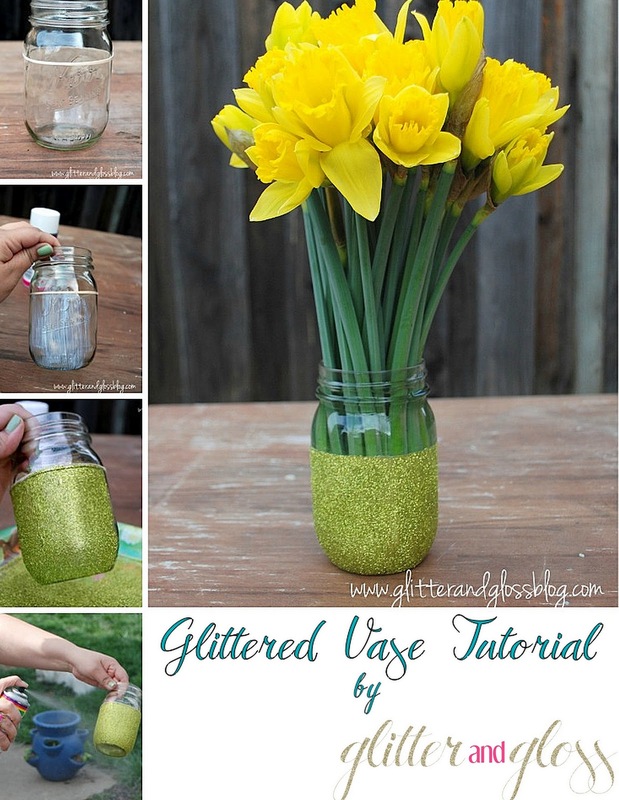 I have a few clear glass vases that would make great glitter glass vases! i am OBSESSED with this!!!! !